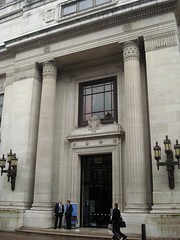 Museum in Freemasons' Hall in Covent Garden, covering the history of Freemasonry. Entry is free of charge. Visitors are required to sign in and wear a visitors' pass, but there's no security check. The museum is situated on the first floor of the building, up a sweeping staircase and along wide, high-ceilinged corridors lined with firmly closed doors. The vestibule of the museum itself contains the current temporary exhibition (as of March 2010 this was "Freemasons and the Royal Society", a selection of books and other items relating to men who were prominent in both organisations). The main room of the museum is packed with items to the point that it's not necessarily obvious where to start. However, there are regular (free) guided tours of the museum and other areas of the building, and there's also a leaflet available highlighting twelve of the exhibits and the stories behind them. The information displayed next to each object gives snippets of relevant background information as well as specifics of the particular item. There's no clear narrative running through the collection, though themes such as the importance of symbolism are emphasised throughout. The exhibits include furniture, ceramics, silverware, regalia, medals, and ceremonial swords. Some of these are personal items, owned by famous historical figures such as Winston Churchill. Others are clearly for communal lodge use, including a 9.5 gallon punch bowl (with an attached recipe starting with a gallon each of brandy, rum, and whisky) and a trio of hefty elephant-shaped cigar lighters made from melted-down silver rupees, each with a brazier on top and wheels underneath to assist in passing them up and down the dining table. The connection with stonemasonry is highlighted with a small collection of engraved silver-plated trowels and mauls used by various royal personages in foundation stone laying ceremonies. A display case of items covering anti-Mason sentiment (including the dry observation that "postcards seem to have been a particularly prolific way of laughing at Freemasons") bears a sign noting that it will be expanded into a larger exhibit in the future. Accessibility: The museum is on the first floor, but there is a lift. There are a couple of steps up to get into the building itself. Last edited 2019-02-06 21:24:43 (version 5; diff). List all versions. Page last edited 2019-02-06 21:24:43 (version 5).